This month is flying by! I still can’t believe it’s November, and it’s already 1/3 of the way through the month. Yesterday Jack and I got to go to lunch with my Grandfather. 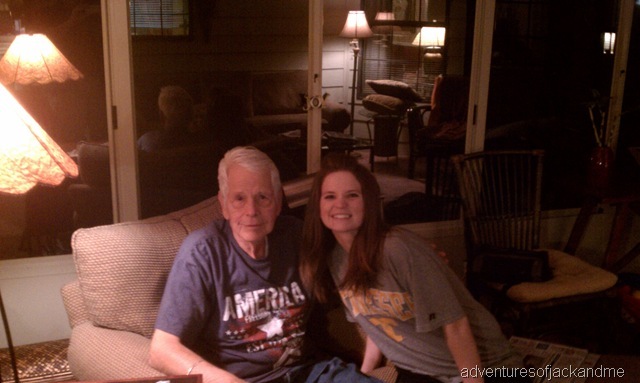 We had a special Veteran’s Day lunch with him and then dinner at his house last night. Last week was a blur. Jack had hand, foot, and mouth disease, and it was rough. Very little sleeping, a lot of crying, and no eating and minimal drinking. He had some dehydration issues, but thankfully we were able to get him to drink just enough until he was feeling better. Now I have hand, foot, and mouth, but it’s not nearly as bad as Jack’s was. Poor boy had blisters all over the place, but his mouth was the worst! So thankful he is so much better! Three weeks ago Jack was around some irritants to his asthma and had a bad asthma attack. He needed oral steroids to help improve his lungs, and our pediatrician started him on an inhaled maintenance steroid – which we have been talking about doing for awhile and now know we definitely need to do. Hopefully it will help to keep him from having these bad asthma spells. He was having trouble getting oxygen in, and I didn’t even realize how bad it was. I felt terrible. But he is ok, and our pediatrician is fantastic at taking care of him and reassuring me. Other than the sickness, we are just moving quickly through the fall. Jack is loving preschool, and he and I are both crazy about his teachers! We ran into one of his preschool teachers from last year at Target over the weekend – it was so nice to see her again. We have been so blessed that Jack has had 4 amazing preschool teachers! These women have taught him [and me] so much, encouraged him [and me], and loved on him when we leave him in their care. I am really enjoying the time I have while he is at preschool. I had decided not to send him this year. When I had thought about it last winter when everyone registers, I thought it would be good for him to be there so I could have some time with our new baby. But after we lost Gabriel, I didn’t think I could send him. And it didn’t feel right, too. I am so thankful for a precious woman who talked to me and encouraged me to take this time. I’m also so thankful for her heart to bless us by sending our toddler to preschool, and so thankful for all of those who helped make it happen. I still can’t believe it, and we feel so undeserving, but are so very thankful for that gift. It has been really nice to have that time and be able to rest, work on some things, and heal. Really thankful for this sweet gift. That’s about all that’s going on around here. That and that it is freezing today! I’m going to go dig out our winter clothes now. We definitely need them now. Hope your week is off to a nice start! Grateful Sweet Jack is on his way to being so much better! Please remember you are the very best, most terrific Mother for him- The Lord chose you and Tommy for him!! Wonderful photo of you and your Grandfather! You are a wonderful comfort for him to be sure! Please Thank him for his service for our beloved nation!